Continuous Performances: A vaudeville parody from Victor Herbert's 1899 comic opera The Ameer. Announcement "Continuous Performances, from 'The Ameer', sung by S. H. Dudley, Edison record." A good example of the high-spirited period at the end of the gay 1890s. This song is one of several by Victor Herbert from his 1899 comic opera The Ameer. 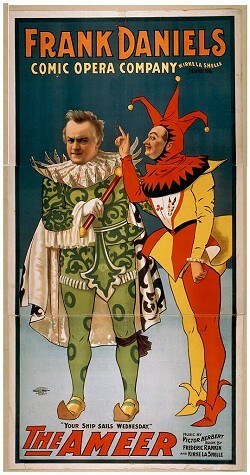 It parodies the (questionable) quality of vaudeville shows that used a new technique: Rather than presenting the traditional few shows a day, many big-city theaters would run all-day continuous shows (a practice later revived in the 1920s and 30s in movie theaters). (courtesy of The Library of Congress).